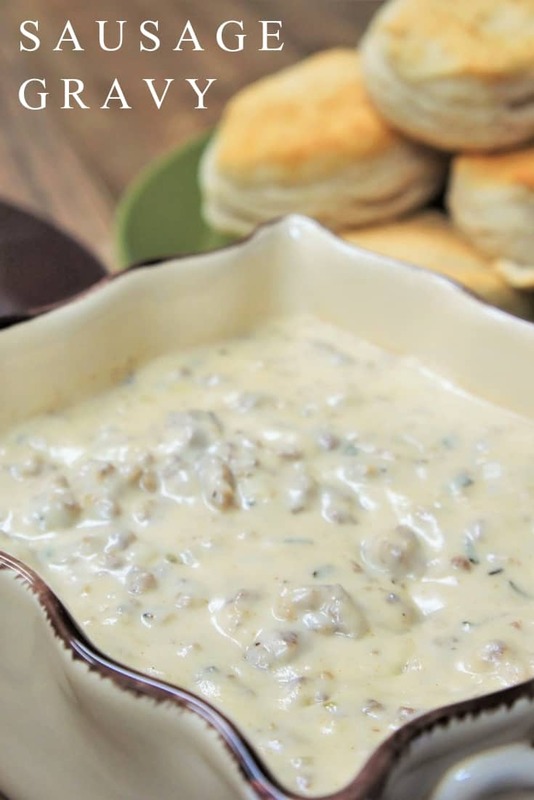 Sausage gravy is the perfect dish for brunch, and it works for breakfast-for-dinner too. 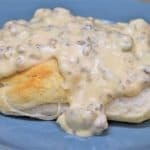 My family has been enjoying this sausage gravy for years. My step-dad would make this on leisurely Sunday mornings, and we loved it! Served over warm biscuits, this thick, creamy, and super flavorful gravy is comfort food at its best. I hope your family enjoys this sausage gravy as much as mine does. If you’re looking for more comfort food favorites, try this creamy chicken and rice casserole, or this classic broccoli cheese casserole. 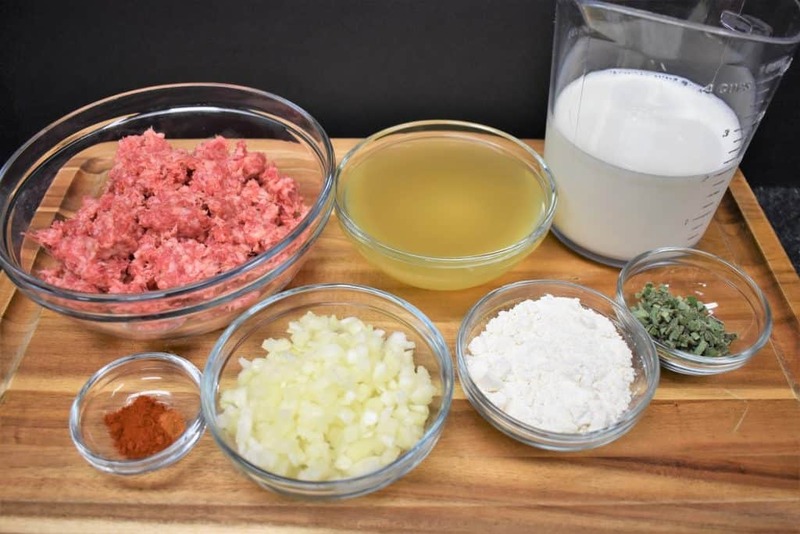 This sausage gravy recipe is pretty easy to make and uses only a handful of ingredients. But, things move quickly and it a lot of stirring to make the gravy. It’s best to have everything ready to go before you start cooking. Tear the sausage into small pieces. It will be much easier to break up if you get it started before it hits the skillet. Dice the onions, chop the sage and measure out the spices, flour, half and half and the chicken broth. I like to get everything ready using glass nesting bowls, they’re great for keeping my ingredients organized. Heat a large, deep, non-stick skillet over medium heat. Add the sausage to the skillet and cook for 5 minutes. 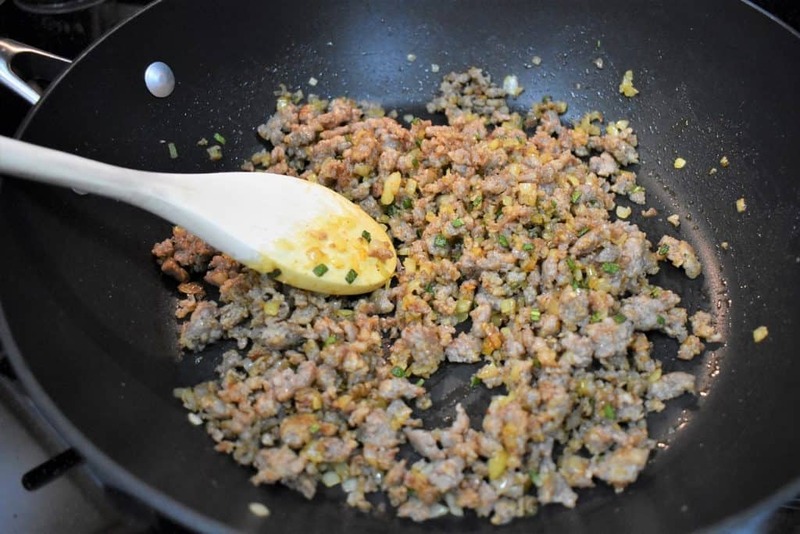 Stir the sausage frequently and break up any large pieces using a wooden spoon or spatula. Add the onions to the skillet and cook for an additional 5 minutes, stirring occasionally. Then add the sage, paprika, and cayenne pepper. Stir well to combine the ingredients. 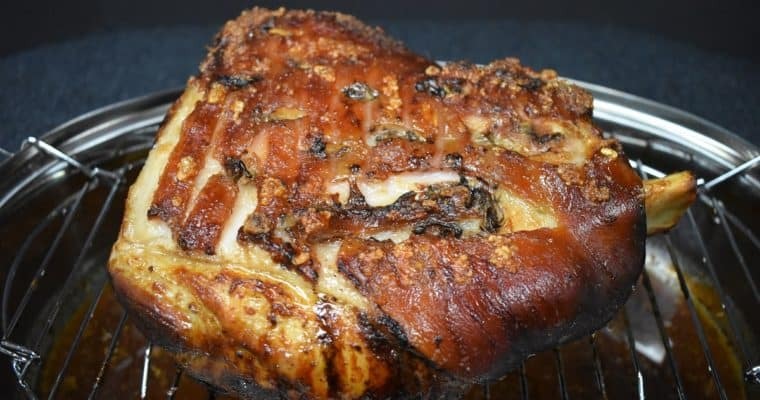 At this point your kitchen will smell amazing. Your family may come out of their rooms asking what you are cooking! Now, for these next steps, you need to stay right next to the stove and stir frequently. Add the flour to the sausage mixture, stirring as you add it in. 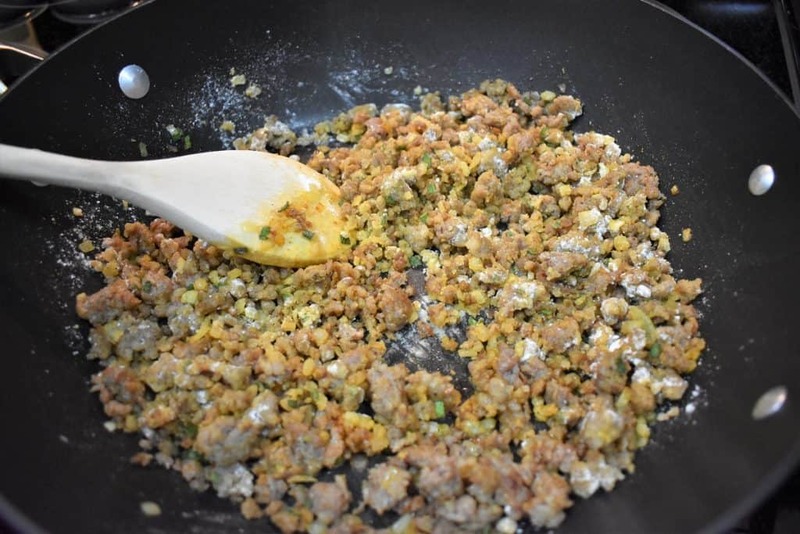 Cook the sausage mixture for 1 minute, stirring constantly until the flour is incorporated. Slowly add the half & half while stirring the sausage mixture until combined. 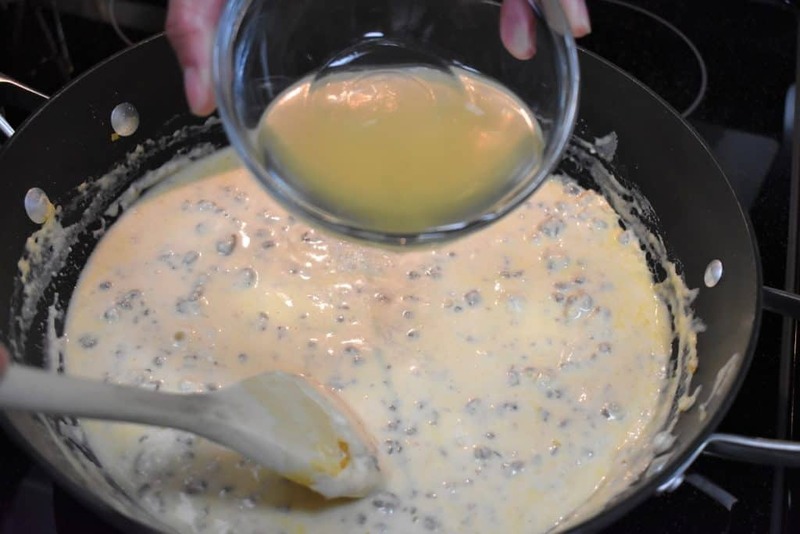 Continue cooking the sausage gravy for approximately 3-5 minutes, stirring frequently. Next, slowly add the chicken broth and continue stirring. When the gravy begins to simmer, lower the heat to medium-low, cover and cook approximately 7 minutes, stirring frequently. 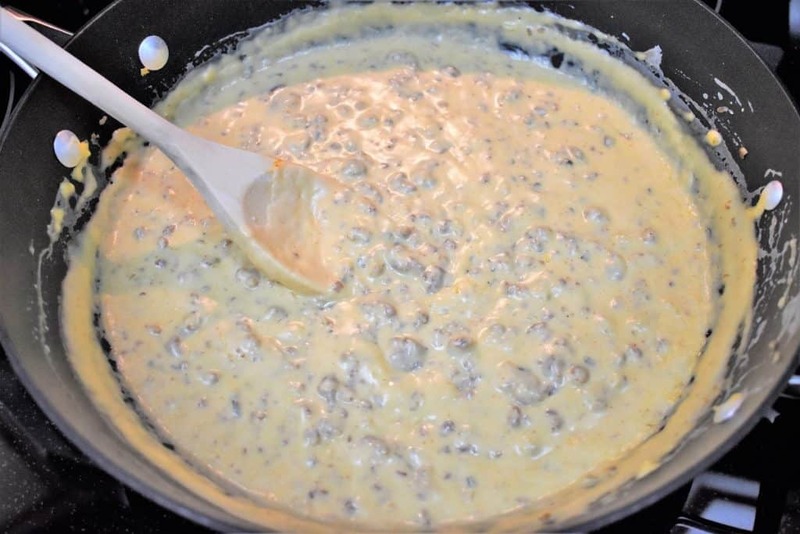 Taste the sausage gravy and add salt (if needed) and a pinch of pepper, stir. 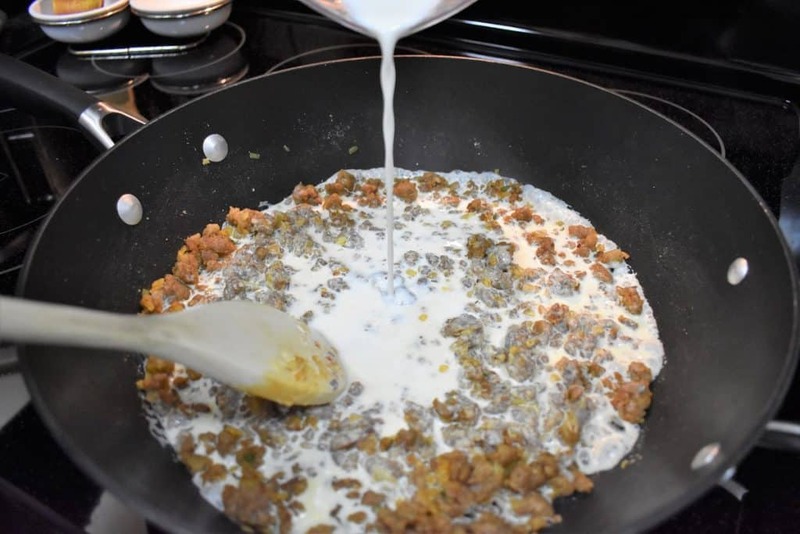 You will see the sausage gravy thicken up nicely. If the gravy is too thick, add more chicken broth, a tablespoon at a time, while stirring until it reaches the desired consistency. If you have leftovers (which is doubtful) add a little bit of chicken broth to the gravy and reheat. It will loosen right up. Serve the sausage gravy over warm biscuits, we just used the canned stuff. They were fine, the gravy is the star of this show! 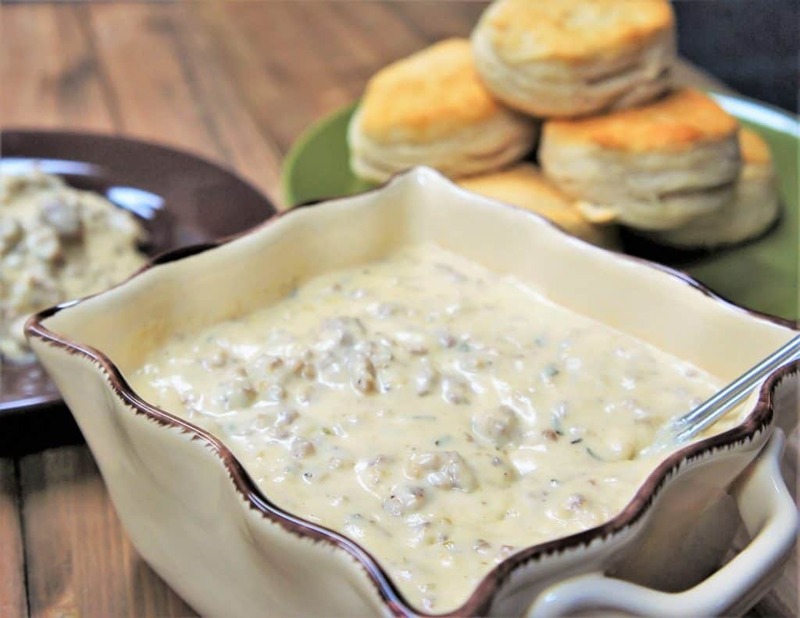 Sausage gravy is the perfect dish for brunch, and it works for breakfast-for-dinner too. Heat a large, deep skillet over medium heat, add the sausage. Cook the sausage for approximately 5 minutes, while stirring and breaking up any large pieces with a wooden spoon or a spatula. Add the onions to the skillet and cook for an additional 5 minutes, stirring occasionally. Add the sage, paprika, and cayenne pepper (if using). Stir to mix well. Add the flour to the sausage mixture, stirring as you add it in. Cook for 1 minute, stirring constantly. Slowly add the half & half while stirring the sausage mixture until combined. Continue cooking for approximately 3-5 minutes, stirring frequently. Slowly add the chicken broth and continue stirring. When the gravy begins to simmer, lower the heat to medium-low, cover and cook approximately 7 minutes, stirring frequently. Taste the sausage gravy and add salt (if needed) and pepper, stir. 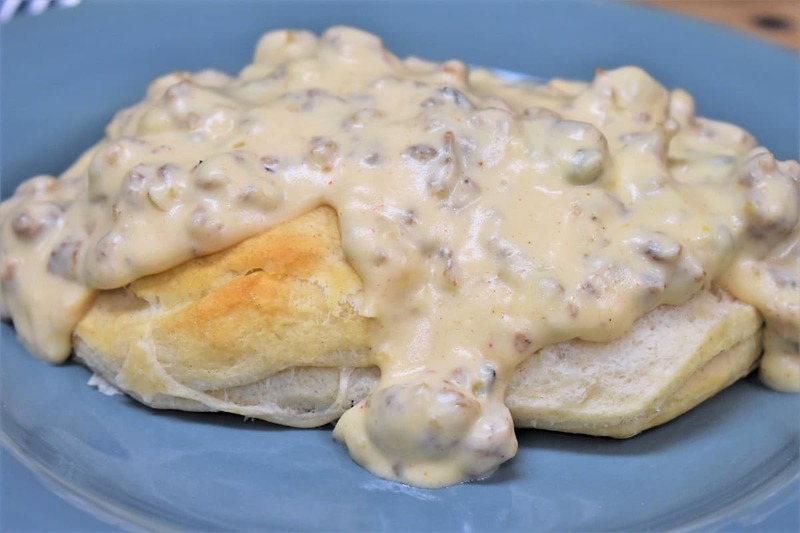 Serve the sausage gravy over warm biscuits. If the gravy is too thick, add more chicken broth, a tablespoon at a time, while stirring until it reaches the desired consistency. If you have leftovers, add a little bit of chicken broth to reheat and the gravy will loosen up.